The three styles of Greek architecture are distinguished by the form of the columns. The Doric was the oldest and simplest, the column having a simple capital and no distinct base. The more slender Ionic column rested on a base, and the capital was adorned with a spiral roll. The Corinthian, latest of all and a modification of the Ionic, had a capital embellished with designs taken from the acanthus leaf. 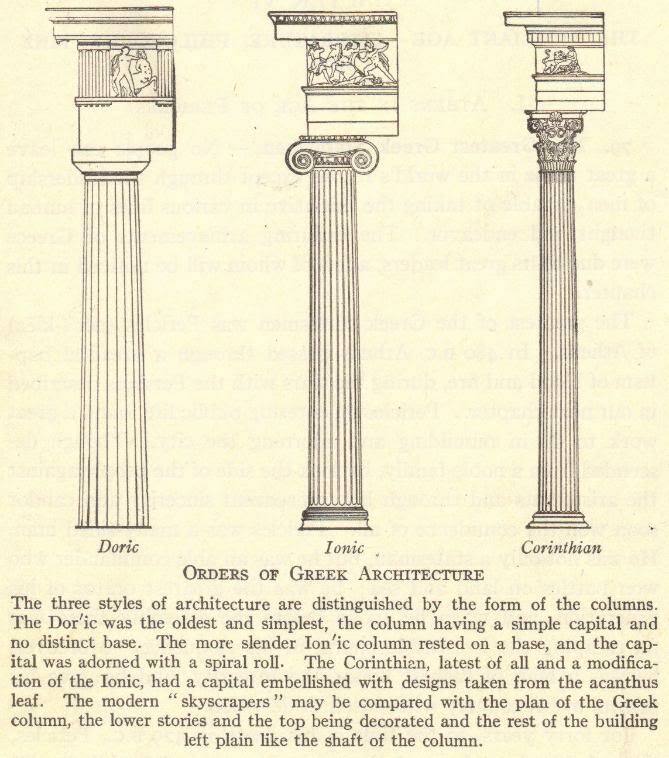 The modern "skyscrapers" may be compared with the plan of the Greek column, the lower stories and the top being decorated and the rest of the building left plain like the shaft of the column. Classical Greek column and architectural styles regained popularity during the Enlightenment period of the eighteenth and very early nineteenth centuries, a style known as neoclassical. Many buildings around the world, and in the United States, are neoclassical in design, including the White House and Capitol Building in Washington, D.C.